Pearls are not difficult to find in jewelry stores but they are very expensive. But nothing can be compared to the one that a Filipino fisherman found. The record setting pearl wasn’t found a few days ago, the fisherman had actually kept it under his bed for 10 years. The fisherman who had the pearl under his bed for years thought it was a good luck charm. The 75-pound pearl is not easy to hide but it remained under his bed for ten years before a fire made him move. The fisherman decided to give it to the tourism office, where they found out that it was much bigger than the other record setting pearls. The gigantic pearl is worth $100 million. The pearl, which is currently being displayed at the Palawan island, is not the first giant pearl to be found in the area. 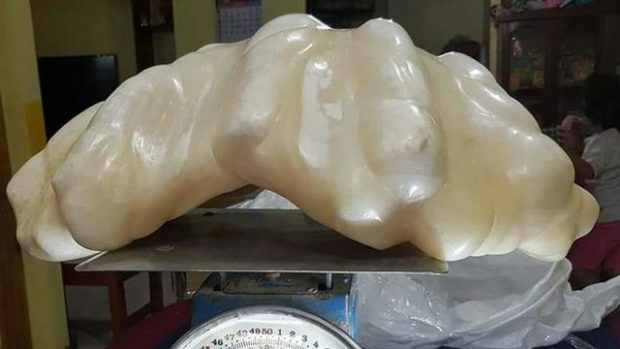 A 14.1-pound pearl was the previous record holder until the fisherman showed the tourism office what he had in his home. The second largest pearl was found in the Palawan sea, which surrounds the island where the record setting pearl is currently being displayed. The pearl was first valued at $60 million and $93 million years later. Other businesses and exhibits have valued the pearl at $42 million and $35 million. In the last few years, other large pearls have been found in the area but nothing as big as the one the fisherman had under his bed. The fisherman was unaware of the pearl’s value but he recently gave it to the tourism office, where it was found that it could be a record holder. If it’s confirmed that the pearl formed in a giant clam, it could be worth what estimates have recently said. 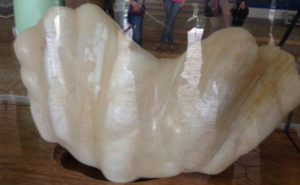 The pearl is five times larger than the previous record and it is currently being displayed in a glass case at the Puerto Princesa Tourism Office. The world’s largest natural pearl will probably remain in the area so that it can bring more tourists to the city. The fisherman will reportedly receive a reward from the government.